Cookie butter is all the rage these days, and what better way to enjoy this trendy ingredient than mixing it with chocolate? Sweet, slightly spiced cookie butter is mixed with semi-sweet chocolate to form a rich, luscious ganache filling. I like to stir some crushed cookies into my ganache to give it a little crunch and enhance the cookie flavor. Cookie butter has become very popular lately, and is readily available in many large well-stocked grocery stores, gourmet food shops, and some specialty stores like Trader Joe's. If you'd like to try another cookie butter recipe, check out this Cookie Butter Swirled Fudge! Place the chopped chocolate or chocolate chips and the cream in a medium microwave-safe bowl and microwave until melted, stirring after every 45 seconds to prevent overheating. Once the chocolate has melted, add the cookie butter and stir until the mixture is entirely smooth. It may not look like it will come together, but keep stirring and you will eventually have a smooth, shiny chocolate mixture. Chop the cookies until they're coarse crumbs, and stir the crushed cookies into the ganache. Press a layer of cling wrap on top of the ganache. Place the bowl in the refrigerator until it is firm enough to scoop, but is not rock-hard, about 45-60 minutes. Using a small cookie or candy scoop, or a teaspoon, scoop up small balls of the ganache and roll them between your palms to get a round shape. If they stick to your palms, dust them lightly with cocoa powder to prevent the truffles from sticking. Place the chocolate candy coating in a medium bowl and microwave until melted, stirring after every 30-45 seconds to prevent overheating. Allow the coating to cool for a few minutes, until it is still warm but not so hot as to melt the truffle centers. Once the coating has cooled a bit, using dipping tools or a fork, dip a center into the melted chocolate until it is completely submerged. Remove it from the coating and allow the excess to drip back into the bowl. Place the truffle on the foil-covered baking sheet. While the top is still wet, sprinkle it with a big pinch of crushed cookie, sprinkles, nuts, or other toppings of your choice. Return the truffles to the refrigerator until the chocolate sets, about 20 minutes. 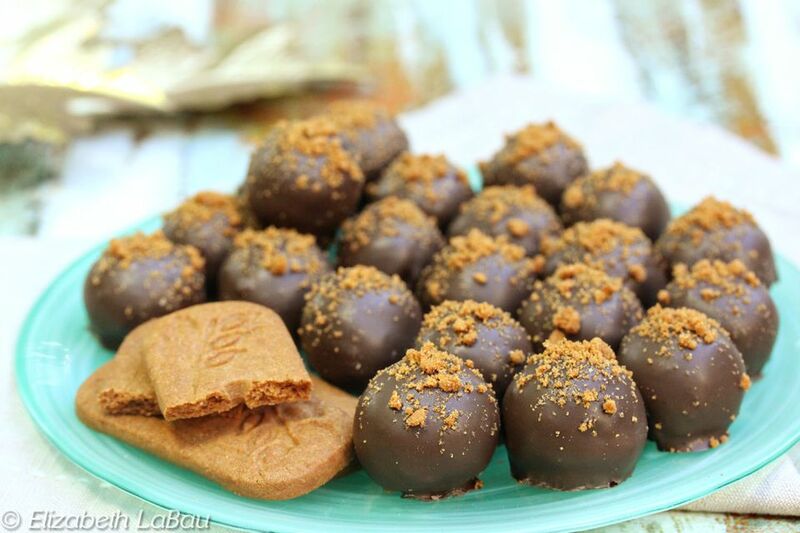 For the best taste and texture, serve these Cookie Butter Truffles at room temperature. Store the truffles in an airtight container in the refrigerator for up to a week.